In collaboration with NSW DPI and the GRDC, the response of wheat and barley (Warndoo 2015) and wheat, triticale and canola (Breadalbane 2015) are being investigated. 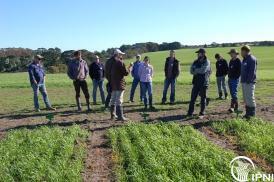 Responses of wheat and canola to K are assessed at Glenthompson (2016) with Southern Farming Systems and the reponse of pasture yield and quality to N, K and Mg is being addressed at Bessiebelle. Additional demonstrations have been undertaken on pastures in coilaboration with Meridian Ag P/L. Support of these trials is provided by Canpotex P/L and IPNI ANZ. A field site was selected at Glenthompson in the high rainfall zone of southwest Victoria, Australia to further evaluate the responses in that region to potassium (K). The site selected was of moderate soil K status (assessed by bicarbonate extraction at 50 mg/kg K), although the reported critical values for soil test K are uncertain for these soils and environments. Five rates of K (0, 25, 50, 100, 150) were applied at seeding to wheat, canola, and faba beans in a small plot experiment. Earlier projects have identified that potassium (K) removal is increasing in high rainfall cropping zones (annual rainfall 550 mm) as the area and yield of crops both increase with crop intensification. Previous research in this region has shown responses to applied K. To provide additional information, two field experiments were undertaken during 2016. In collaboration with New South Wales DPI and GRDC, two grain response experiments were in high rainfall ( 550 mm) regions that are in transition from pastures to cropping and this work aims to provide K responses that growers can use to interpret soil test results. At Breadalbane, the exchangeable K soil test concentration was 34 mg/kg (0 to 10 cm depth), and 15 mg/kg (10 to 30 cm depth). Crops received 0, 12. 5, 25, 50, 100, or 150 kg K/ha as KCl applied just after crop emergence. K responses at Breadalbane 2015.